Cruise through the Swan Valley in style with uberVINO. Planning a wine tour? Toast goodbye to the hassle of organising transport! 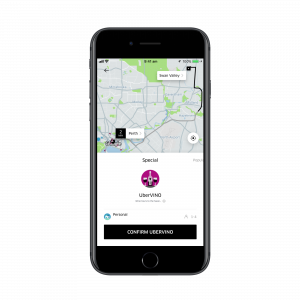 This October, discover a modern and convenient way to get around the Swan Valley’s best wineries, breweries and fine food purveyors – with uberVINO. You’ll be matched with a driver who will remain as your designated driver during the entire trip. Choose your winery itinerary or try our suggested wine tour. For an hourly rate of $40 through the Uber app, you can swan through the best wineries the Swan Valley has to offer – and the best thing is, you can split the fare with your wine-tasting mates! We’ve teamed up with the best wineries in the Swan Valley to offer you exclusive deals along our suggested wine trails. Begin a grape enthusiast’s tour at Sandalford Winery where you can enjoy some world class offerings from one of WA’s founding winemakers. Next up,travel to Lancaster’s famous rustic outdoor tasting shed, nestled amongst some of the oldest vines in the Swan Valley. Finally, delve deeper into Vino perfection at Providore, where you’ll be finish up tantalisingly close to the Margaret River Chocolate factory. Because the only thing better than wine, is wine with chocolate. Take the opportunity to sample some exceptional Vino and bites at Ugly Duckling Wines whilst enjoying the accompanying breathtaking views. Next, whet your appetite with a selection of the best craft beers that the Swan Valley has to offer at the award winning Mash Brewing. The journey can then round off at the Cheese Barrel, where a gorgeous selection of mouthwatering cheese boards and wine await. Here, you’ll be overlooking the tranquil Susannah Brook. Mash Brewing will get you started with brilliant Swan Valley beers and ciders satisfying any and all tastes. Pause briefly at the Cheese Barrel to delight your taste buds further before quenching thirsts once more on the shady green lawn of Funk Cider with one of 12 super-cold taps of weekly-rotating, fresh ciders! Kick off at the gorgeous Sandalford Winery and soak up its history alongside a glass of carefully curated, world class Vino. The journey can then continue onto Ugly Duckling Wines where you can enjoy a bite to eat, a glass of something delightful and great atmosphere. To top it all off, tantalise your senses and stop by Mash Brewing to enjoy some award winning brews and nibbles. Trips are charged by the minute at a rate of 67 cents/minute ($40/hour) starting at a $60 minimum fare. Uber riders must be aged 18 years old or older. Maximum of 4 riders per car.